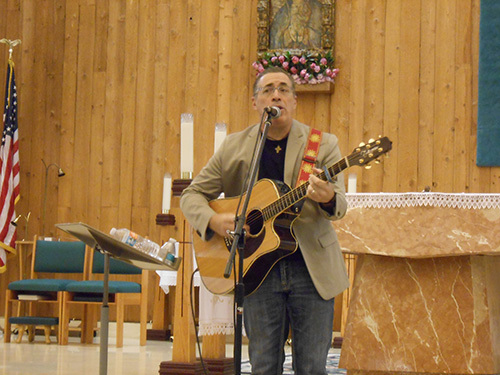 Steve Angrisano, a Catholic singer and songwriter, delivers a powerful message of healing through song and testimony. A resident of Littleton, Colorado, he sang at the funerals of three of the Columbine victims. CORAL SPRINGS | It’s been a little over nine months since 17 students and teachers died in a terrible shooting at Marjory Stoneman Douglas High School. But the day remains fresh in the minds of many of the residents of Coral Springs and Parkland. To offer continuing spiritual support to the community, Msgr. 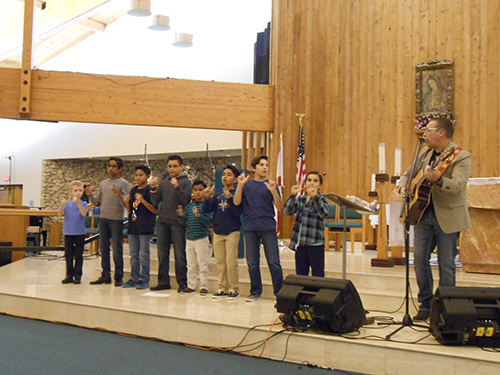 Michael Souckar, pastor of St. Andrew Church in Coral Springs, brought singer and songwriter Steve Angrisano for a family concert Nov. 16, and to lead a retreat for high school students the next day. Angrisano was a youth minister in Littleton, Colorado, not far from Columbine High School, and he sang at the funeral of three of the victims of that horrific school shooting in 1999. Steve Angrisano invites young people to join him in leading attendees with hand movements to the song, "Trading my Sorrows," during his concert Nov. 16 at St. Andrew Church in Coral Springs. Castaneda noted that healing and recovery from any tragedy, whether a horrific event like Parkland or simply the loss of a family member, takes time and work. In the weeks and months following, he has spoken to the students in St. Andrew School and the religious education classes. 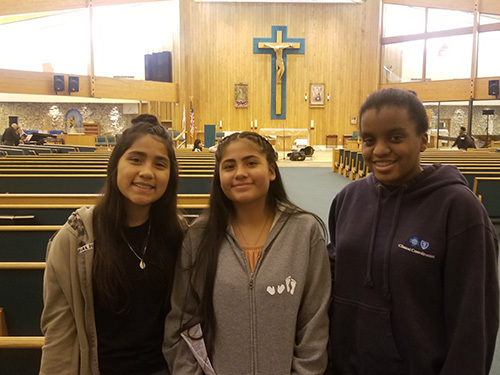 Jenn D’Angelo Lucovic, youth minister at St. Elizabeth Ann Seton Parish in Coral Springs, has been a rock of support to the teens in her youth group, who lost two members of their community in the shooting: Cara Loughran and Gina Montalto. “Gina’s smile would light up any room. She had the brightest spirit and was so full of joy,” D’Angelo Lucovic said. Loughran was a peer minister in the religious education program. Lucas Finney, a teen in the St. Elizabeth Ann Seton youth group and a student at Coral Glades High, taught a class with her on Monday nights. “The last thing she ever said to me was, ‘Are you ok?’ because I wasn’t in the best mood. She was so sweet and kind, even though I annoyed her sometimes. I miss her,” Finney said. Saint Andrew students, from left, Miranda Curi, Sofia Curi, and Thereza Zephir pose for a photo after the Steve Angrisano concert. D’Angelo Lucovic said she received “incredible support” in the form of prayers, handwritten cards and letters, and spiritual bouquets from youth ministers and youth groups from all over the U.S., Australia, Ireland and several other countries. That showed her teens the “bigger” Church and was one of the things that helped them get through the year. “It meant a lot to my teens. They read every one,” D’Angelo Lucovic said. She noted that the youth group’s “hangout afternoons” on Mondays and Tuesdays, established well before the tragedy, came in especially handy when the teens from Stoneman Douglas were out of school for three weeks after the shooting. Reporter Gigi Fontanilla and photographer Ashley Witherow are members of St. Andrew Parish in Coral Springs. This spiritual bouquet says, "St. Andrew praying for St. Elizabeth Ann Seton." St. Andrew is a church and youth group located only one hour away from Sandy Hook in Newtown, Connecticut. 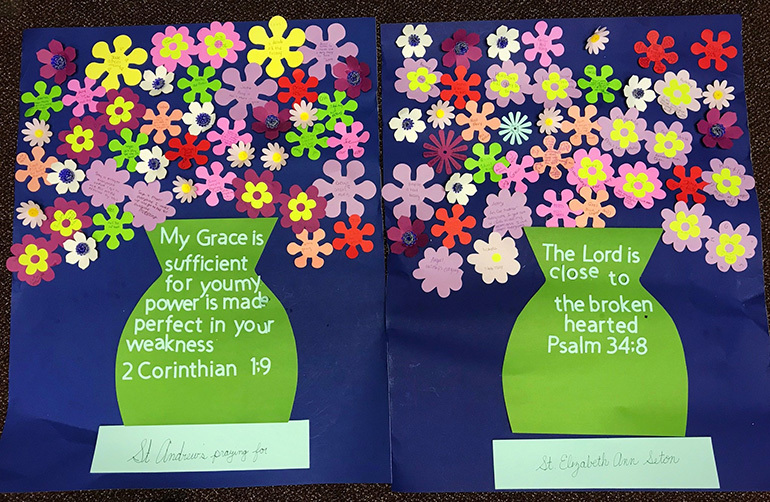 The youth minister there sent this to St. Elizabeth after the Parkland shooting, along with various prayer cards and medals.